it's okay in here for an O'Neills. mix of types and generally good service. 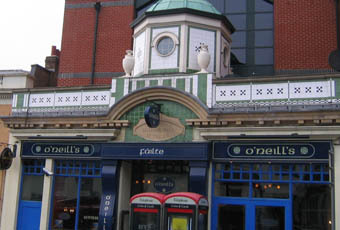 For an O'Neills this is a decent little boozer. Friendly, helpful bar staff, table service without asking and good quality beer. I have been going here for over 5 years and always had good experiences. It's certainly a better alternative to The Northcote or the other chain bars further down the road. A really nice chain pub. Good range of beers, well poured and deffinatly not flat. Good service from friendly french staff, who do table service as well. I know that it is a chain boozer, but it is a good boozer. Very confused over the negativity this place seems to have attracted on this site. I've frequented this pub over the past 4 years and it has always been somewhere I can sit down and have a quiet drink and a chat on a weekday and have more lively nights out on Fridays and Saturdays. Contrary to other comments, the service is prompt, the staff are very friendly and make you feel at home - certainly a place you could make your local - totally devoid of the pretentiousness found elsewhere in Clapham Junction. Sadly, the management seem to have taken notice of comments made here and taken measures such as withdrawing stools from the bar (why?!?!) to the dismay of paying regulars - can we have them back please?